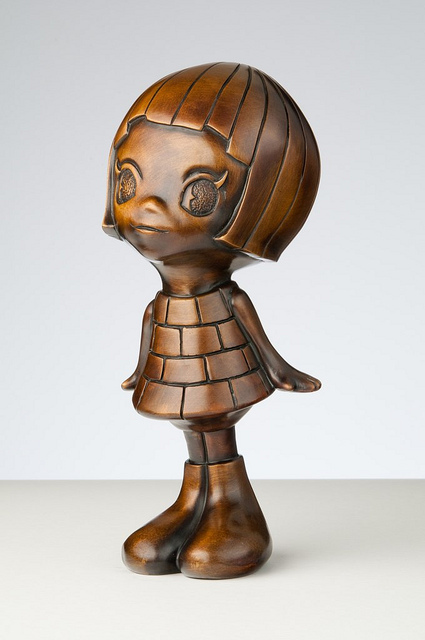 The Toy Art Gallery just published their first bronze sculpture; ‘Hapiko’ by Yosuke Ueno. ‘Hapiko’, as described by Yosuke, is a Lucky God, common in Japanese folklore since ancient times. She is a quintessential Yosuke Ueno character, a smooth, innocent figure, nose-less and without eyebrows. She is often featured in Yosuke’s paintings and represents the Happy Girl. View more of Yosuke’s paintings, drawings and sculptures at www.spaceegg77.com. The ‘Hapiko’ bronze statue was sculpted by Yosuke Ueno, stands 9 inches tall and is limited to an edition of 10. It went on sale today at store.toyartgallery.com. Look for Yosuke to return to Los Angeles this April alongside Jacub Gagnon of Toronto, Canada. ‘Elements and Oddities’ will open on April 30th at Thinkspace in Culver City. More details announced soon.